"And Bombyx mori," she finished up, "is the Latin name for a silkworm." "Yeah, and you know what? I always thought they were like spiders spinning their webs, but you know how they get silk from the worms?" "They boil them," said Robin. "Boil them alive, so that they don't damage their cocoons by bursting out of them." The second installment in the Cormoran Strike detective series proves to be just as well-written as the first, if increasingly hardboiled. While The Cuckoo's Calling skillfully kept readers sorting and resorting through a large cast of possible suspects, The Silkworm narrows its focus down to a smaller bevy of suspects while greatly heightening the level of gore. Middle-aged housewife Leonora Quine seeks Strike's help when her husband, the infamously narcissicistic author Owen Quine goes missing. Quine's most recent manuscript, Bombyx Mori, incriminates many of his peers who all have reason for wanting to halt its release. When Quine is discovered to have been gruesomely murdered in the same manner as his manuscript's hero, Strike must figure out who could have known about the content of these unpublished pages and would have been sadistic enough to seek such a horrific revenge. Aided by his assistant Robin (whom Galbraith, thankfully, does not position as a love interest), Strike must sort through the list of literary players who all seem justified in hating a man who left little traces of love behind. Rather than not being intended for the faint of heart, The Silkworm is not for the faint of stomach. Both the contents of Quine's book and the method of his demise are laid out in graphic detail. 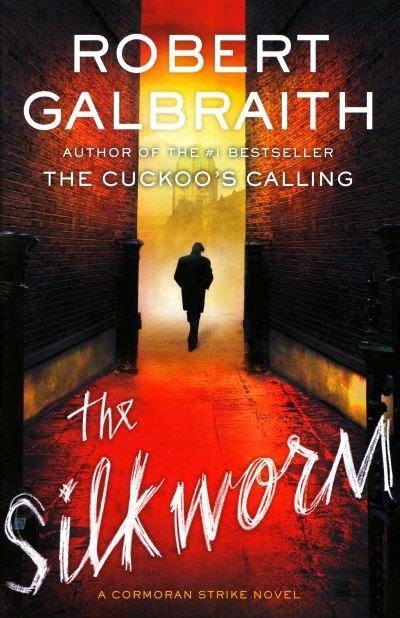 Rowling (under her pseudonym Robert Galbraith) manages to craft Cormoran's character so that he is both blunt yet reserved, rough yet vulnerable, off-putting yet likeable. The Silkworm, like The Cuckoo's Calling, promises to establish private detective Cormoran Strike's legacy alongside the likes of Sir Arthur Conan Doyle's Sherlock Holmes and Agatha Christie's Hercule Poirot. Click here to read my book review of The Cuckoo's Calling which appeared in Prairie Schooner: Briefly Noted.